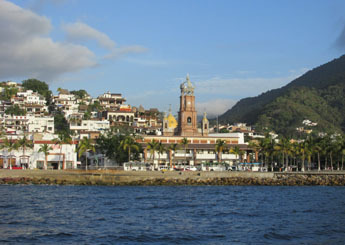 Conde Nast Magazine called Puerto Vallarta "the friendliest city in the world." 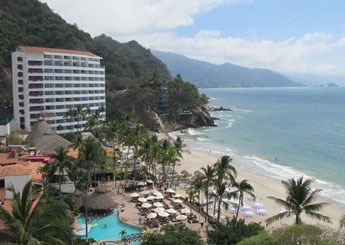 AARP voted Puerto Vallarta the top destination for Americans to retire overseas. U.S. News & World Report voted it the #2 place to visit in Mexico as well as the #4 best spring break destination. There are 330 days of sunshine and the average temperature is 83 degrees. Many airlines fly into the newly renovated and expanded Gustavo Diaz Ordaz International Airport. Puerto Vallarta sits on the same latitude as the Hawaiian Islands, and enjoys a consistent sub-tropical climate throughout the year with the rainy season limited to June through September. Tourism is the main industry and tourists are treated with respect, as friends. 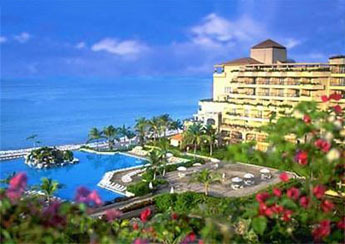 Puerto Vallarta is located in the state of Jalisco, on the Pacific coast of Mexico. 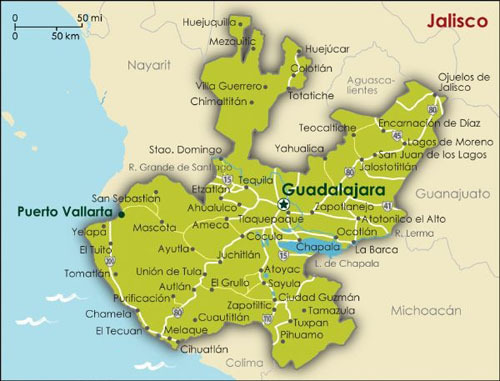 It is the same state where Guadalajara and Tequila (yes, there is a town with that name) are located. The area features 40 miles of coastline and includes tropical jungles, rocky river beds, steep mountainsides and arid flat lands. Its 256,000 residents welcome over 3.9 million visitors a year, second only to Cancun. 1.5 million are visitors from the United States and Canada. It is also a very popular port of call for cruise ships on Mexico's Pacific Coast. 50% of the population works in tourist related industries. The city is the most gay friendly in all of Mexico. There was an LGBT convention in town while we were there. The city was made famous (or infamous) by the 1964 movie "Night of the Iguana", filmed entirely on location. Written by Tennessee Williams and directed by John Huston it starred Richard Burton, Ava Gardner, Deborah Kerr and Sue Lyon. Elizabeth Taylor had a relationship with Richard Burton during the filming. Both were married to other people at the time and they purchased a house – Casa Kimberley – that was separated by what is now called "The Bridge of Love". John Huston was enamored with the city and built a house at a nearby isolated cove called Las Caletas (see details below) where he lived part time until his death in 1987. The city is divided into the Marina, hotel zone, downtown, zona romantica and the south. 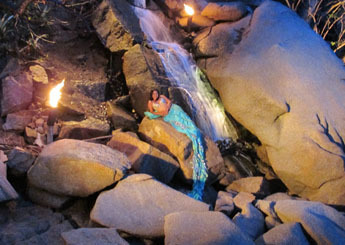 The South Shore is where the Sierra Madre Mountains meet Banderas Bay creating many secluded beaches, coves and rivers. Downtown and Los Muertos Beach is the heart of the city with restaurants, bars, nightlife and shopping. It is very walk-friendly with its cobble-stoned streets, wrought-iron balconies and red-tiled roofs. The Malecon (boardwalk) lines the beach for 10 blocks and is home to much of the sand sculpture and public art. Travel and Leisure Magazine named Puerto Vallarta the best beach in Latin America in 2014. It is there that the Arcos (Arches) lead to the town's main square with their open-air concerts and performances. The landmark Iglesias de Nuestra Señora de Guadalupe church is a must stop here. 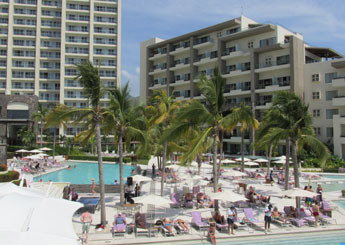 The Hotel Zone stretches from downtown to Marina Vallarta and includes many high-rise condos, as well as hotels. Le Kliff - Perched on the edge of a cliff a short drive south of downtown it offers spectacular views of the ocean. Seafood is their specialty. 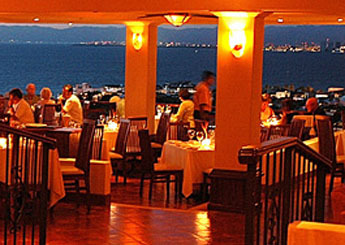 Vista Grill Restaurant and Lounge - It overlooks Puerto Vallarta and Banderas Bay. The temperature controlled wine room is next to the bar. It was awarded a Five Star Diamond Award from the American Academy of Hospitality Sciences. Sit outside on the multi-level terraces for a perfect view of the sunset. Marriott Casa Magna Resort - The resort has its own resident clown to entertain the children of guests. The children's club provides activities for kids 4-12. The hotel's Tequila sommelier oversees their 170-label collection. The property was also awarded top recognition from Mexico's National Tequila Regulatory Council. Café des Artistes - Located downtown with two separate restaurants. 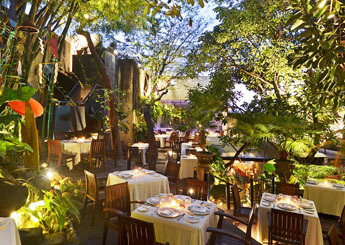 The canopied multi-level garden offers vertical lighting reflecting from the trees above the tables. They have a comprehensive wine library. It is an environment in which patrons are inspired by the relationship between architecture and landscape. 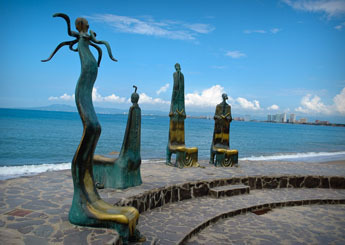 Le Malecon - View the permanent sculpture pieces along the 2,854-foot long boardwalk. 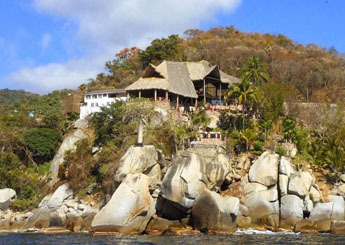 Las Caletas - Once the private home of film director John Huston, it is now a private beach hideaway (exclusive to Vallarta Adventure customers) on Banderas Bay accessible only by sea. This tropical beach hideaway has places for lunch/dinner, swimming, snorkeling, scuba diving, kayaking, sunbathing or strolling along the jungle paths There is also a parrot, monkey and owl area with opportunities to learn about and pose with any or all of them. Secret Hotel - Hydrotherapy water treatments – Hot, cold, swirling, neck, back, shoulders. All self-service and wonderfully refreshing. 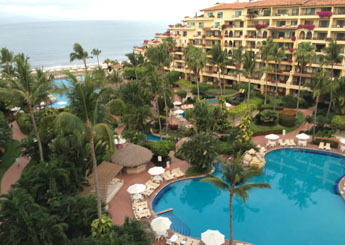 Velas Vallarta - A family all suite all-inclusive, and its sister adjacent property Casa Velas (adult all suite all-inclusive). La Leche - The restaurant is visually amazing. Everything is white on white with milk cans for decoration. The large tables in the middle of the restaurant are communal. Everyone sits together and shares. The bag on top of the plate? That is your bread and it is delicious! 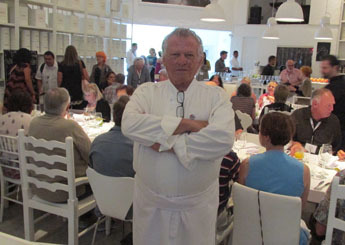 Each night the menu at La Leche changes based on the fresh ingredients the chef (Alfonso Cadena) receives from local vendors. 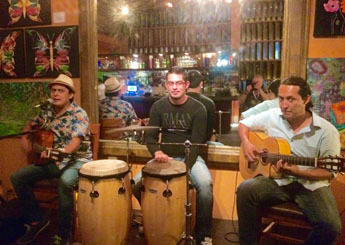 River Café - Live music and a natural environment. Infinity water fountain, tropical vegetation and art work by Oleo. Great food. 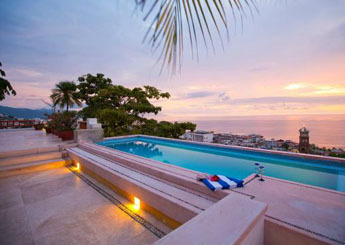 Nemi Eco Villa - Joe & Nicole Sanchez moved to Puerto Vallarta from Chicago in 2008. As an architect he designed this 6-bedroom villa from shipping containers and to be environmentally friendly (composting, flowered plants etc.). Rented through Airbnb & Villa Rentals for $800-$1,500 night (3 night minimum) plus the cost of food ordered by the staff (included). Not a hotel, one can rent the whole villa or the top 3 or bottom 3 bedrooms. High season is late November thru late March. 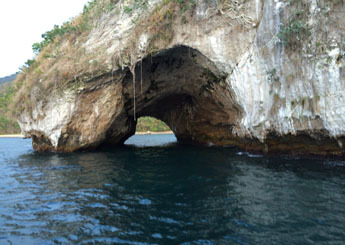 Los Arcos (Arches) National Marine Park - Small granite islands that jut out of the water. The largest is 82 feet high and boats can go through those rocks. Lots of birds, snorkeling and diving. 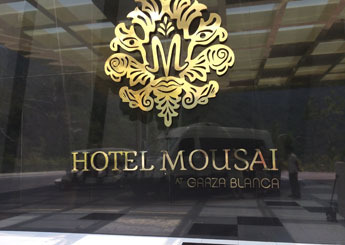 Hotel Mousai - 72 suites and adults only. AAA 5 Diamond. Opened December 2014 on the property above the Garca Blanca Preserve Resort- 172 room family-friendly. River on the property with the mountains behind the hotel that are part of the hotel. $250 PP all inclusive low season & $750 in high season. Start out at a real working ranch nestled in the Sierra Madre foothills. 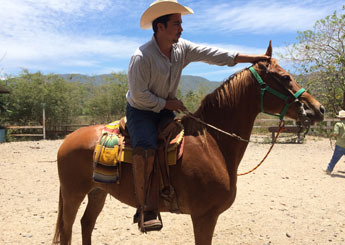 Go for a ride, and then stop to bathe in the volcanic hot springs and after the ride, relax at the Hacienda, eat or drink at the restaurant, and learn about how tequila is made. Rocks are slippery. 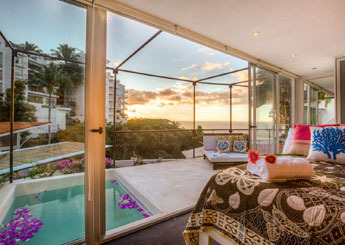 Luna Liquida Boutique Hotel - 14 rooms spread over 5 villas. Added a new section to the owners former home. Hyatt Ziva - First hotel for this new concept. Opened December 20, 2014. It was a different hotel before being refurbished. 335 rooms, all-inclusive family oriented. There is a 24-hour deli in addition to the other restaurants. Wi-Fi is included.